Starting XI: Rami Hamadi, Musab Al-Battat, Abdelatif Bahdari, Mohammed Saleh, Alexis Norambuena; Mohammed Darweesh, Pablo Tamburrini; Yashir Pinto Islame (Mahmoud Wadi), Nazmi Albadawi (Jonathan Cantillana), Tamer Seyam (Sameh Maraaba); Khaled Salem (Oday Dabbagh). Recap: In a lively affair, Palestine began proceedings by pressing the hosts far up the pitch. Their initiative was rewarded with an early corner that resulted in a chance that was nearly steered home in the 6th minute. Three minutes later the Chinese opened the scoring on the other end through a free kick. Feng Xiaoting's looping header settling in the far post much to the chagrin of Palestine's shot stopper Rami Hamadi. The nature of the goal; Xiaoting beat two defenders to the ball, and the fact that a man on the far post could have cleared the shot, will leave the coaching staff with a lot to think about ahead of the 2019 AFC Asian Cup. To their credit, Palestine responded well after going down a goal winning a series of set pieces and nearly equalizing through a corner kick that found the forehead of captain Abdelatif Bahdari. For the second straight game, Nazmi Albadawi was lively dictating affairs in the middle of the pitch with the adept support of Pablo Tamburrini and Mohammed Darweesh behind him. There were moments to forget in the first half as well, Rami Hamadi had to save from close range following Mohammed Saleh's defensive error. In the final stages of the first stanza, a counter attack exposed Palestine and only a last ditch effort from Bahdari prevented what would have been a second goal. The second half began well for Palestine with Khaled Salem charging down on a counterattack just one minute into proceedings. His choice to shoot instead of pass will and should be questioned as he had Tamer Seyam and Yashir Islame running alongside him. In the 53rd minute Yan Junling had to tip a long range effort from Mohammed Darweesh. There was an overwhelming sense that an equalizer would come as the cameras kept cutting to a baffled Marcello Lippi on the sidelines. The breakthrough did indeed arrive; in the form of a brilliant through pass from Alexis Norambuena that sprung Yashir Islame for his sixth international goal. Palestine proceeded to defend the lead adeptly over the next half an hour as they continued to rack up corner kicks and half chances. 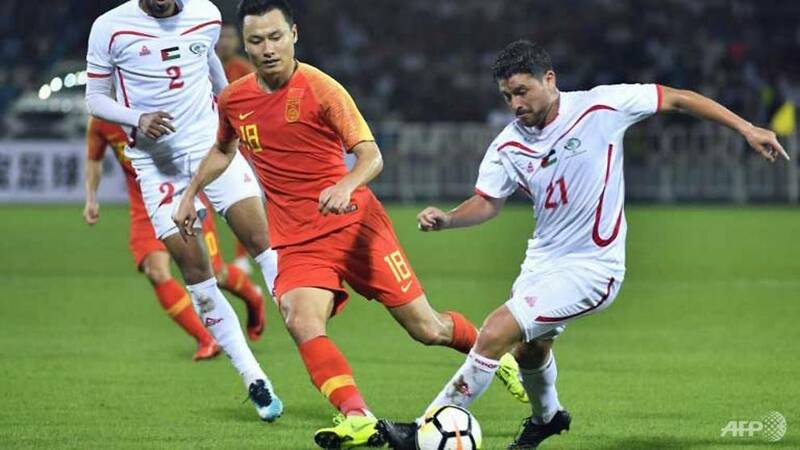 In the end, they had a credible draw against an established Asian side and a significant boost with just 47 days until their Asian Cup opener against Syria. What I liked: This was a solid performance- perhaps the best under the auspices of Noureddine Ould Ali- the national team won a slew of corners and generally avoided the sloppy play that mired their previous game against Pakistan. Palestine isn't a team used to rescuing points from a losing position so the fight displayed throughout the game was nice to see against a physical opponent. What I didn't like: Starting with Khaled Salem. With all due respect to the season he is having in the WBPL, the 29 year old's decision making and finishing has been suspect whilst with the national team. That was on display again today. I don't understand why a forward with proven goalscoring ability in Europe (Saleh Chihadeh) was not given a real chance to show what he can do, especially since he won't be able to join the pre-Asian Cup camp until at least December 16th. Calming Effect: The game, and more importantly, the performance should allay fears about the team's preparedness and the ability of Noureddine Ould Ali who has been oft criticized by the fans. What's Next: Palestine will camp in Morocco from December 2nd. A squad of 30 players is expected to participate.